One of the most important culinary herbs to come out of the Mediterranean region Hardy in zones 5-10 or house plant Mild pleasant flavor Prefers the sun Immediate shipping in 3" pot. 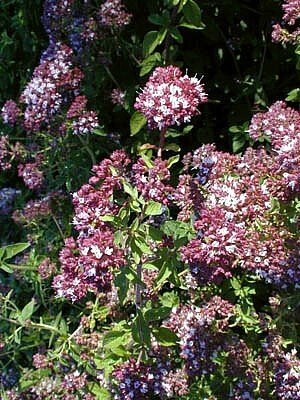 An attractive groundcover with purple leaves clumps to three or five inches tall. Summer flowers are pink on twelve-inch stems, most numerous in August. As an ornamental it is a first-rate edging plant. As a culinary herb it has a mild pleasant flavor either fresh for salads, cooked in soups or cassaroles or stir-fry, or dried & crumbled for use out of season. Easily propagated from cuttings or by division, it wants well-drained moderately fertile soil in full sun & not too droughty. It's cold-hardy at minus 20 to minus 10 degrees F. It also makes a great house plant in a sunny window. Oregano is one of the most important culinary herbs to come out of the Mediterranean region. A spice-rack arsenal with nothing but oregano & basil could well be sufficient to make any cook seem a genius. It is a true healthfood rich in antioxidants, the plant's essential oils having antimicrobial & antifungal components, besides simply looking good & tasting good.